The term Dextrocardia means that the heart is in the right chest (dextro means right in Latin) rather than in the left chest, as is the usual case. There are various forms of dextrocardia, ranging from a normally configured heart that is positioned further to the right than normal (dextro-position) to so-called "mirror-image dextrocardia," in which the positions of the heart chambers and major vessels are exactly the reverse of the "normal" arrangement (see diagram at left). Chest x-rays and an ECG (echocardiogram) may be used to determine which type of dextrocardia is present. Isolated dextrocardia (i.e. 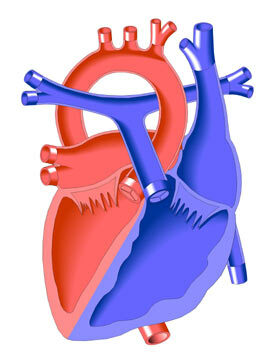 without any other associated heart defects) is a rare condition and occurs with equal frequency in males and females.